Job Title: Institutional Advancement Manager Reports To: Director Status: Staff, Full-time Salary: $25-$30K + Medical/Dental Benefits Description: Urbanity Dance is looking for an Institutional Advancement Manager to start mid-September. The position is full-time. A pivotal new addition to the growing team, the Institutional Advancement Manager will be focused on communications, marketing and development. The Manager must be an excellent writer, have superb interpersonal skills, ability to multitask, work independently, and to be a self-starter. Candidate must be fully invested in the continued growth of the company, inspired and enthusiastic about the vision of the company. Strong potential for continued growth within the organization. Core Responsibilities: - Thinking creatively to grow Urbanity's three pillars: 1) audience/press for the professional company and performances 2) student population (adults and children) and 3) raise awareness about our community programming. Development: - In collaboration with the Board and Executive Director, build a robust annual fundraising plan that includes individual giving, events, corporate partnerships, and foundation grants - Manage the organizations database to ensure data integrity. This includes, data entry, gift tracking, list and report generation - Create systems for gift processing from gift receipt through to gift acknowledgment - Serve as the organization’s main contact with donors, including communications regarding Urbanity news and events - Foundation research, prospecting, and proposal generation - Serve as the organization’s representative at artistic and cultural events-- - Manage 3-5 fundraising/awareness events throughout year and working with Board of Directors and to organize responsibilities Marketing and Communications: - In collaboration with the Board and Executive Director, create an annual marketing and communications plan that includes a message and communications calendar to track all social media and email communications, press strategies, website updates, as well as a plan for evaluation of communications and marketing efforts - Writing press releases and responding to press inquiries in a friendly, timely, and effective manner - Facilitating (along with graphic designer) a website overhaul & new print materials - Writing blog entries and contributing as a dance writer to news publications - Managing social media and email communications - Managing team of 2-3 arts administration interns Qualifications: The ideal candidate will have/be: - Dance background is not necessary, but a passion for arts and community education is essential - Strong preference for 1 year of work-related experience - Bachelors degree required - Marketing competency and demonstrated experience in marketing, including market strategy, demand generation, market research, and marketing communications - Efficient multi-tasker - Delivering effective presentations - Strong analytical and problem solving skills - Strong attention to detail - Excellent communications, writing and customer service skills - Interest and/or experience in non-profit management and/or arts administration - Computer skills, including Microsoft Office Suite - Knowledge of Adobe Creative Suite (InDesign, Photoshop, etc.) not required but is a plus. An aesthetic sense for web design (website, newsletter) is a plus. - Interest and/or experience in photo, video, web editing - Friendly personality, able to represent Urbanity in the press and media - Ability to work independently, and as a member of a team - Flexibility, positive attitude, and good work ethic To apply: Email cover letter and resume to urbanitydance@gmail.com or Urbanity Dance, 280 Shawmut Ave, Boston MA 02118 Urbanity Dance exists to inspire, engage, and empower individuals and communities through the art of dance and movement. New Ballet Ensemble & School (NBES) located in Memphis, TN is seeking full-time teaching and performing artists for the 2019-2020 season. The mission of NBES is to bring youth together by providing equitable access to excellence in dance training. “New Ballet” was the recipient of the National Arts and Humanities Youth Program Award in 2014, has been reviewed in the NY TImes, and has performed at the John F. Kennedy Center for Performing Arts. Position would include: 36-40 week contracts with benefits; Professional development including American Ballet Theatre School and the National Dance Institute NYC, NY. The season includes three mainstage productions annually, school tours and performance collaborations in locations throughout the area. Guest choreographers include Francesca Harper, Elizabeth Corbett Frankfurt Ballet, Uri Sands, Kim Jones and Blakeley White McGuire. Dancers applying should demonstrate: a strong teaching and performing ability and a love for children. · A high technical level of ballet and/or modern dance, the ability to teach varying levels of dance and ability to lead rehearsals and set choreography; versatility is a plus at New Ballet. In addition to classical ballet, the repertoire includes Memphis Jookin, Hip Hop, West African, Flamenco. Professional company credentials and/or BFA in dance strongly desired. Certification or experience in ABT and NDI methods, a plus. Send dance and teaching CV, headshot and reels to careers@newballet.org for consideration and audition details. 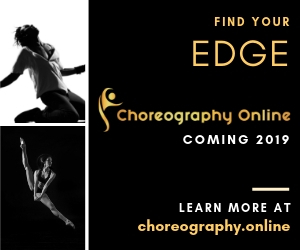 The Ellové Technique is seeking experienced dance instructors to bring this exceptional class to your own students at your local dance studio or gym. We provide our certified instructors with the tools and support they need to feel inspired, empowered and successful. The Ellové Technique is a non-impact conditioning class taught by certified instructors. It is designed to strengthen and rejuvenate the body through the pure techniques of ballet, yoga, fitness and Pilates. Moving through an intentional playlist of music, the class seamlessly incorporates alignment principles, balance and full body awareness while focusing on the breath. The Ellové Technique’s use of therapeutic principles improves posture, balance, strength and flexibility, and is recommended cross-training and injury prevention for dancers. Attend either our Portland, OR training on August 23-25, 2019 at Rose City Studios or our Denver, CO training on October 4-6, 2019 at The Denver Athletic Club. DanceWear Corner is your destination for all things dancewear and we are always looking for talented, hardworking people to join our team. Whether you are looking for a full or part-time role in Customer Service, Sales, Warehouse Operations, Internet Marketing or are interested in beginning a retail management career, you will find a challenging and rewarding experience here.